An ambitious and powerful story about idealism, passion, and sacrifice, Eat the Document shifts between the underground movement of the 1970s and the echoes and consequences of that movement in the 1990s. 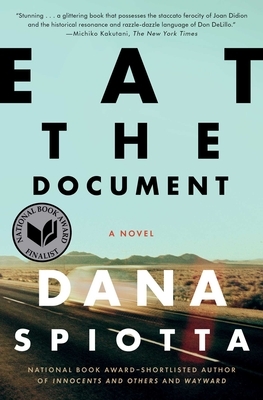 A National Book Award finalist, Eat the Document is a riveting portrait of two eras and one of the most provocative and compelling novels of recent years. Spiotta's writing brims with energy and intelligence." "Infused with subtle wit...singularly powerful and provocative...Spiotta has a wonderful ironic sensibility, juxtaposing '70s fervor with '90s expediency." "Scintillating...Spiotta creates a mesmerizing portrait of radicalism's decline." "Stunning...a glittering book that possesses the staccato ferocity of Joan Didion and the historical resonance and razzle-dazzle language of Don DeLillo."